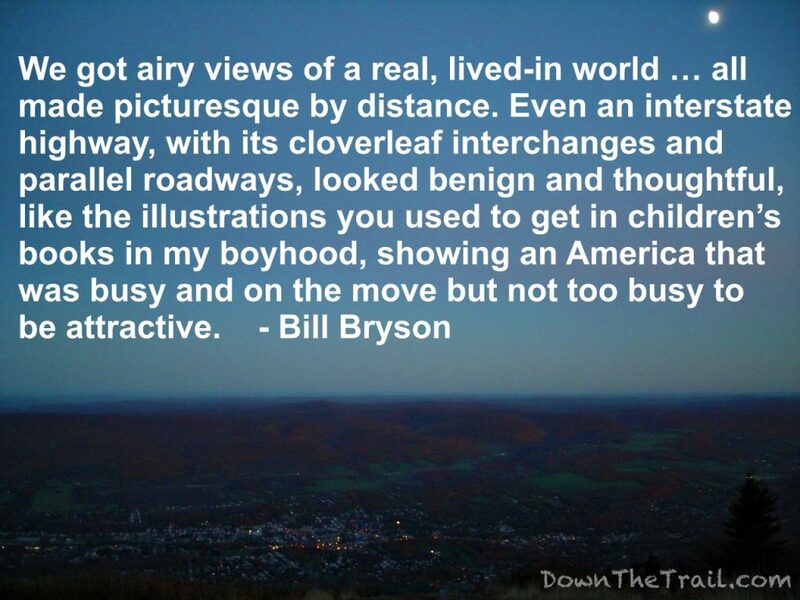 Some Appalachian Trail hikers just love to hate “A Walk in the Woods” by Bill Bryson. It happens to be the best-selling and most widely-read book about the Trail. Which makes him a fat and happy writer. Not only that, but a writer with a Hollywood movie deal. And that’s why folks love to hate him, because many thru-hikers have aspirations of writing a novel about their own journey. And Bryson didn’t even hike the whole trail. That’s right, he only did a “pitiful” 870 miles of it. A good chunk of that was on day hikes, presumably whilst pounding cupcakes and whistling Dixie. 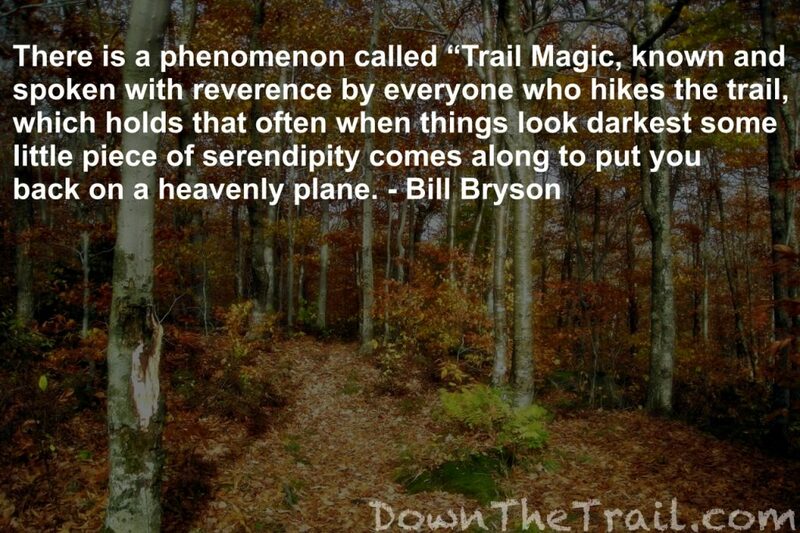 Yet he wrote the most popular book about the Appalachian Trail. He wrote a book, not a journal. Great stories in literature and pop culture can be broken down similarly. A Walk in the Woods is a well-crafted book by a professional writer, not a journal! The guy is downright funny and easy to relate to. 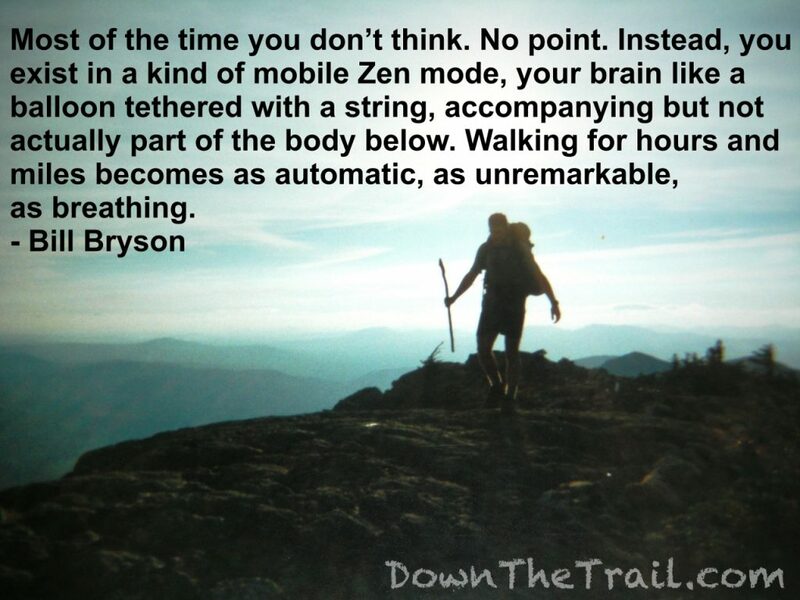 Most people aren’t crazy elitist thru-hikers. Most people are scared of bears, and most people think that hiking 870 miles is pretty darn amazing. Instead he does something far more effective. When was the last time your wrote an interesting fact in your trail journal that wasn’t directly paraphrased from a guidebook? Let’s face it, reading about hiking is never very interesting. So he found things that are interesting. The greater “story” aspect of the book really only takes place when Katz is around. Katz disappears partway through the book and doesn’t come back until the final chapters. Even when Katz is there, the forward progression of our intrepid heroes is broken up by facts about the trail that actually interest readers. He teaches us in a way that’s entertaining and funny. Even the most experienced hikers learn something from this book. He didn’t thru-hike, but 870 miles is a long way… long enough to almost “get it” about thru-hiking. And in this case, almost getting it is enough to write a very good book. The overall feeling of being on the trail. Descriptions of scenery hit home without being flowery and indulgent. Still not convinced? Here’s thirteen quotes to prove it. Ask any number of Appalachian Trail thru-hikers about their big take-aways from the experience, and every single one will mention “the people.” The people they met, the quick friendships and camaraderie. It’s clear that Bryson wasn’t especially interested in bonding with other hikers, but he sees the phenomena and touches upon it. They even make a friend called “Connolly” in Shenandoah, where they happen to be grilled by tourists with the usual “20 questions” …yet another experience with which we can relate. In my own journal I said this less eloquently with simple phrases like “MMM I love Coke,” and so on. 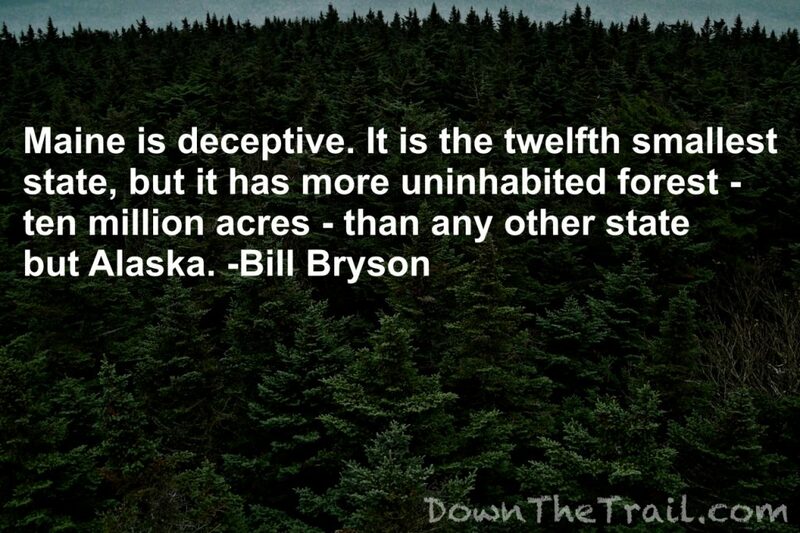 Once again Bryson succinctly sums it up and even makes us laugh. I remember a similar sensation when presented with bagels that were still actually whole and fluffy, aka not crushed. 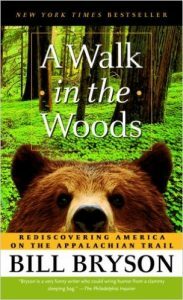 A Walk in the Woods was first published in 1997, before the meaning of the term “trail magic” meant coolers of soda pop along the road and huge “hiker feed” BBQ-cookout events. 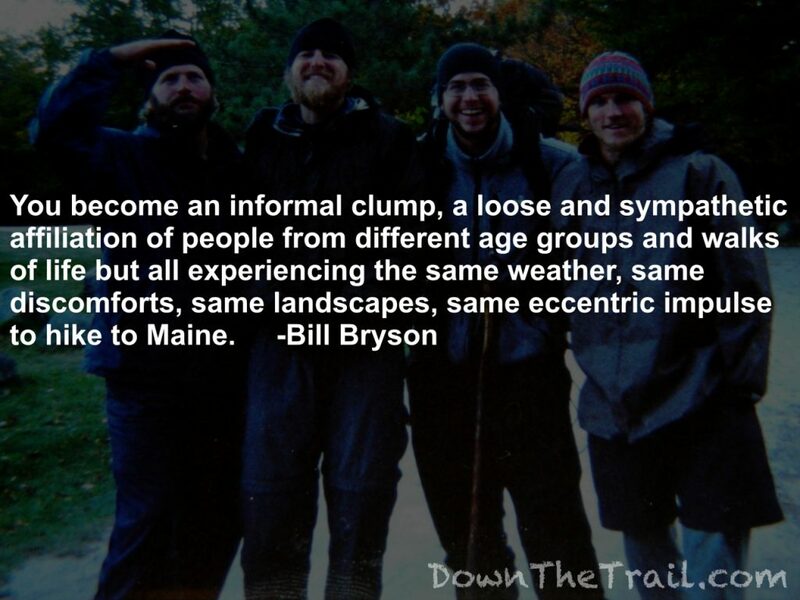 Thru-hiking with a dedicated purpose is a distilled way of life. After a short time, strange things begin to happen in a fateful manner. Chance encounters occur again and again, and things fall into place so often and so perfectly that even the staunch atheist begins to wonder – what the hell is really going on here? The Appalachian Trail is a narrow corridor of forest surrounded by some of the most concentrated populations in the United States. On a clear day you can even see the Manhattan skyline from a piece of the trail in New York. Most of the time you can’t even sense the surrounding cities. The trail is the classic “long, green tunnel,” indeed a “featureless nowhere.” It’s a hideout not unlike Sherwood forest, where you can temporarily break free of the trappings of modern society with a merry band of eccentric backpackers. The woods give the illusion of wilderness where there is none. In my journals I’ve talked about going into “hiker mode” and simply assumed my readers knew what the heck I was talking about… or I’d mention “being in the zone” or “daydreaming.” These aren’t bad descriptions, but just barely adequate. Once again Bryson shows his chops by describing the sensation perfectly. That’s neat. I didn’t know that. Did you? I could put together a whole separate post on neat little facts that Bryson teaches us. In many ways his walk with Katz takes a backseat to the overall education about the Appalachian Trail – its forests and history. If you’re going to hike the Appalachian Trail, then you’re going to have to talk about gear. Bryson, professional writer and non-journal-keeper that he is, whips out yet another entertaining simile with seemingly no effort. Once again, Bryson expresses this common experience better than any journal-keeper. Bryson has a low emotional moment on Piney Mountain, a nondescript location in southern Pennsylvania. It takes place shortly after he begins his day-hiking excursions, in an effort to experience as much of the trail as he can. It’s one of his first hikes without Katz. The surrounding pages reek of the disillusion and suffocating pointlessness that most thru-hikers have struggled with. He externalizes his frustration by lashing out at the supposed poor quality of the maps in Pennsylvania, for example. Completion rates are higher these days. Today approximately 3 out of every 10 hikers who intend to thru-hike the Appalachian Trail actually follow through and complete it, as opposed to about 1 out of 10 in the 1990’s. 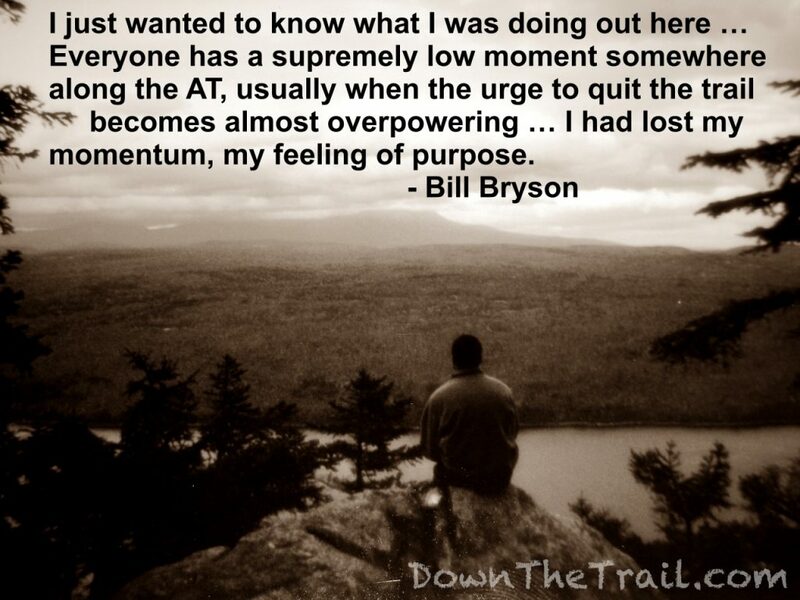 It’s evident that the great majority of hikers experience the overwhelming urge to quit, and Bryson covers it well. 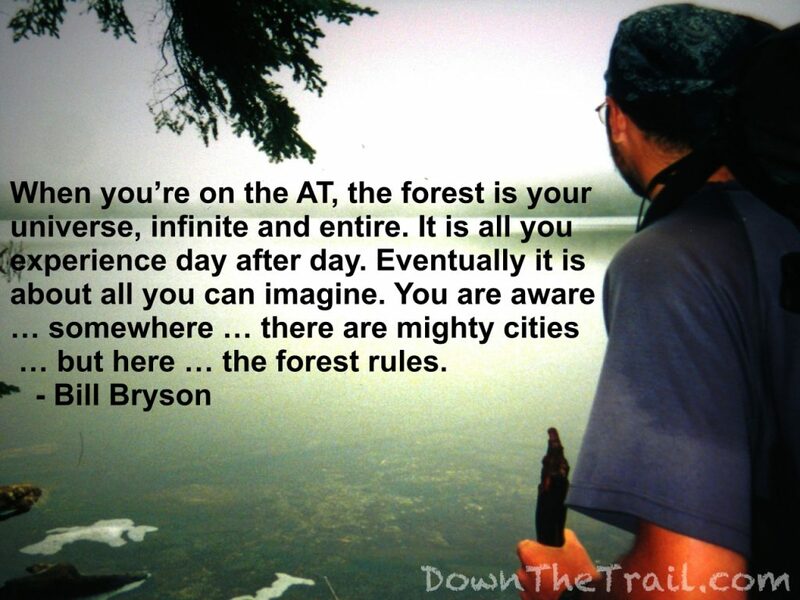 Elitist thru-hikers don’t like A Walk in the Woods because Bryson didn’t finish the trail, but guess what? Most people don’t finish the trail. 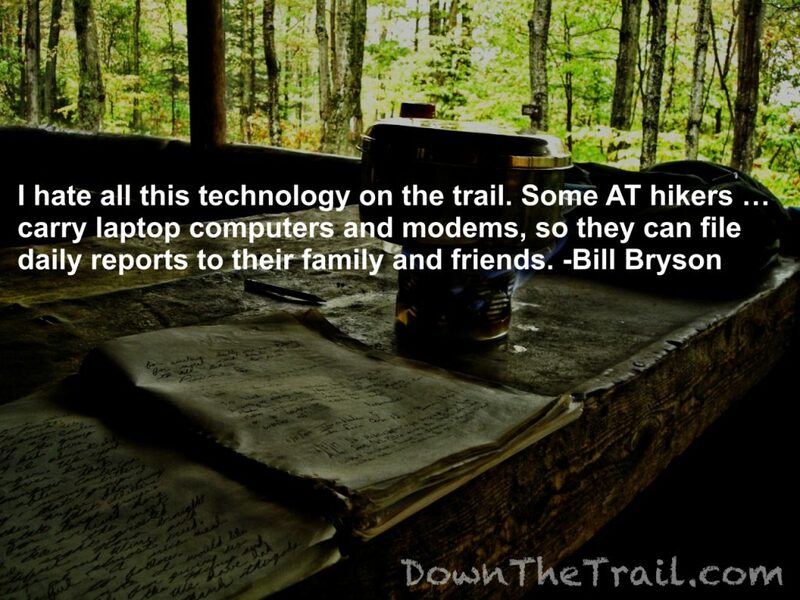 Bill Bryson walked the Appalachian Trail in 1996. After a time on the trail it becomes your whole world. You’re aware that the “real world” is out there somewhere, but you are separate, apart. Some hikers will object… the trail, instead, is the real world. We tend to view the “real world” in a more positive light after some time on the trail, but here Bryson draws upon pure nostalgia. A great part of the Appalachian Trail experience for me was getting back in touch with the summers of childhood. There were days on the trail in mid-summer when I’d hear dogs barking in the valley below, or the sound of lawnmowers. Occasionally the fireflies would come out in the evening, or “lightning bugs” as we called them. A summer thru-hike replicates the days of playing outside without a care in the world. Here Bryson taps that vein so deftly it’s seemingly by accident, without falling victim to taking himself too seriously. This quote isn’t from A Walk in the Woods, it’s from an interview Bryson gave to Town and Country Magazine in 2015 to spread publicity for the movie. Clearly the focus of his hike was to get a book out of it, and he succeeded against all odds. The argument goes that one needs to hike every inch of it to “hike the Appalachian Trail,” which is true in a sense. But Bryson hiked enough of it to get a good book out of it, which is all he really set out to do. Not only that, but he captured the experience and shared it far more effectively than the drudgery that is 99% of our trail journals. Did you like A Walk in the Woods? I just stumbled across your piece, and it was well written Jamie! Thank you for your insight. 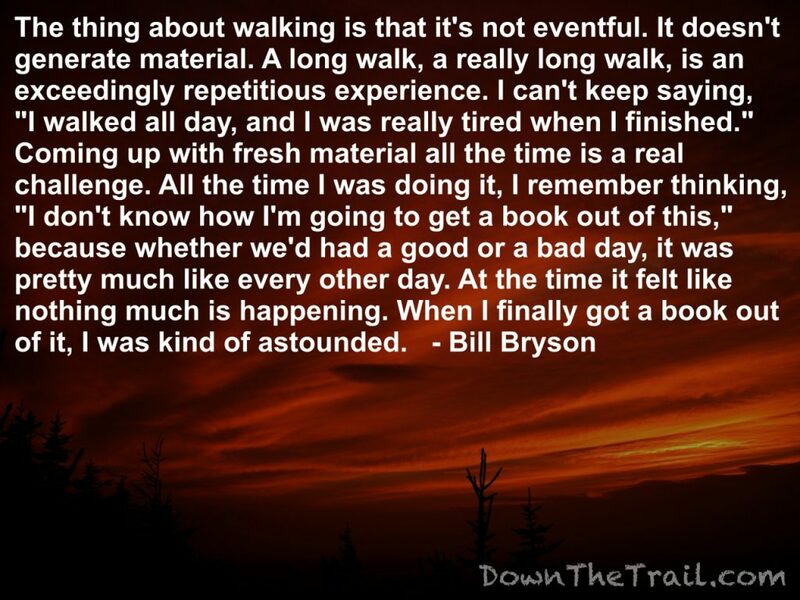 In my opinion Bryson does a great job in his book of describing HIS thoughts of planning a hike on the AT, then giving it a go. As you clearly pointed out, he’s a writer, not a diehard hiker, and he let’s the readers know that, and makes no apologies for it. I’ve done many day trips on the AT, but have not hiked the entire trail, nor do I plan on it, but I’ve have enjoyed my many excursions for what they give me. 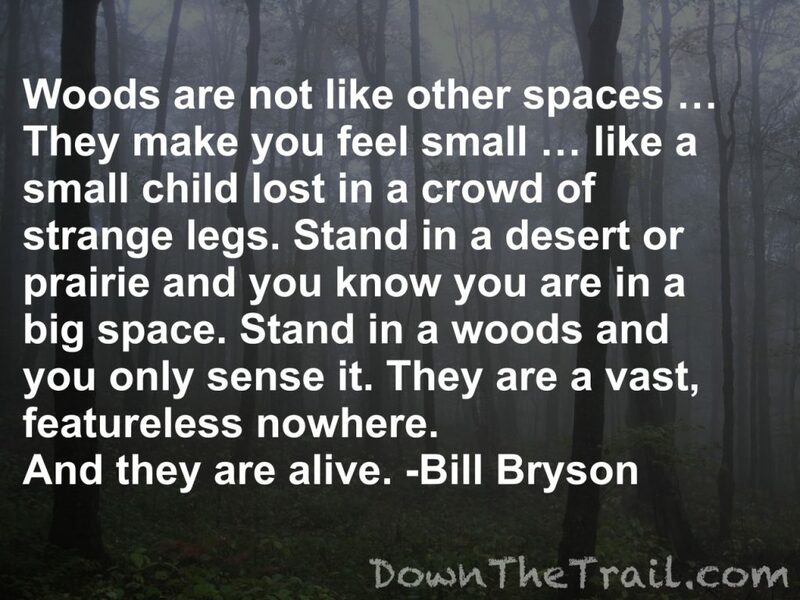 A Walk In The Woods is a good read on a topic that I enjoy. The movie…….not so much. Take it for what it’s worth, Hollywood entertainment with a few famous faces, and enough scenery and environmental messages to try and keep the movie goer interested. Thanks again-keep writing! Thanks for the comment Rich. Happy New Year! Well done. 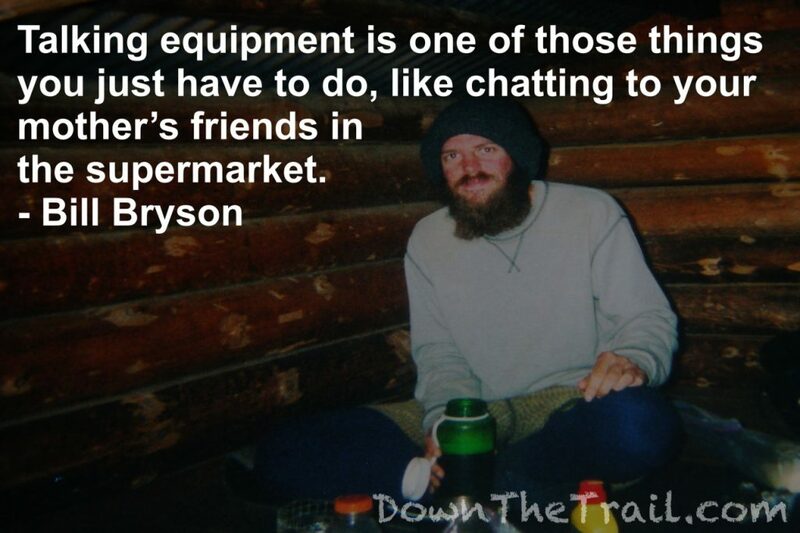 I chuckle whenever I hear fellow thru-hikers trashing Bryson or Cheryl Strayed. My answer to them is always that they approached the subject as *writers* first, hikers second. The vast majority of self-published thru-hike books are tedious, dull and devoid of the slightest insight. There is a second tier of well-written accounts that do a bit more than such glorified trail journals. And then there are artists like Strayed and Bryson (and a few others) who have given us real books. I’ve been publishing my own AT story as a (long) series of blog episodes, mostly so I will have it to remember over the years. To the extent that anyone reads them, I’m pleased, but I don’t presume my story is worth publishing beyond that. I found too much smug cynicism in Bryson’s book, and in your article. “When was the last time your wrote an interesting fact in your trail journal that wasn’t directly paraphrased from a guidebook?” Seriously? The smug cynicism is intended in good humor and maybe I’m guilty of reflecting Bryson’s style since I finished his book. The idea is to look at why he’s so successful when hundreds or even thousands of more experienced hiker-writers are still lost in obscurity. By “interesting facts” in trail journals I mean the background and history that we find in the guidebooks. On the Appalachian Trail for example, journalists tend to paraphrase the history of Blood Mountain GA and the smelting plant in Palmerton PA without digging any deeper. I’m guilty of all the faults I poke fun at in the article, and Bryson’s book is way better than my crappy journals too. Very nice, Jamie. I especially liked your take on #12. I remember those kinds of days from childhood. I’m a fan of Bryson’s book, for exactly the reasons you mentioned. Mostly because he writes well. As do you. My mother tossed his book into my suitcase after I visited her on my way to a canoe trip in the Smokies a few years ago, and I read it in the evenings after boating the Nantahala, Pigeon and Nolichucky, all of which had white blazes at some point along our routes. 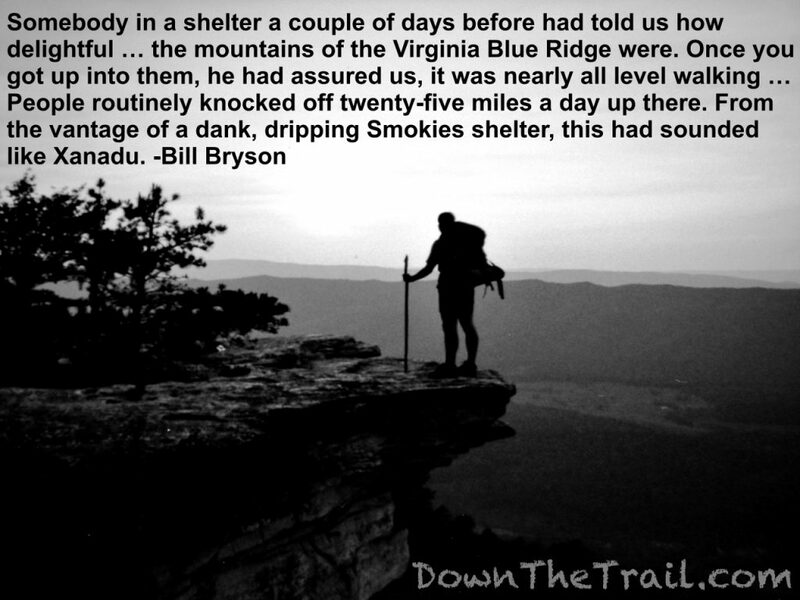 So I credit Bryson with reawakening my desire to hike the AT, long dormant after growing up a Boy Scout and hiker back east. The movie was awful…except for the scenery shots and the fun we had laughing at the mistakes (Redford always had clean, new clothes and even a bathrobe at one point. A grizzly bear? Really?). They were filming at Amicolola just after I left Springer, so both the book and the movie were common topics of discussion along the trail. Thanks Jon! I haven’t seen the movie yet. Maybe they couldn’t come up with a black bear trained for film?